Humans are not the only creatures on Earth that build bridges, but we are the only ones who build bridges intended for more than a single use. Bridges have become so ubiquitous in human culture that, in addition to being used as metaphors ("We'll build a bridge of love and kindness reaching to the other side" as Olivia Newton-John sang in "The River's Too Wide") they have spawned unique fears (gephyrophobia, the fear of bridges), a genre of photography and of course an engineering specialty. Although we humans like to give ourselves credit for these things, the fact is we did not invent bridges. There were plenty of examples in nature to inspire the first would-be engineers. 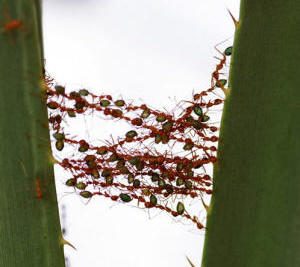 Ants, for example, create bridges of their own bodies in amazing feats of cooperative behavior. They have been known to bridge neighboring leaves, and even streams. Ant bridges are, of course, temporary, disappearing after the last ant has crossed. 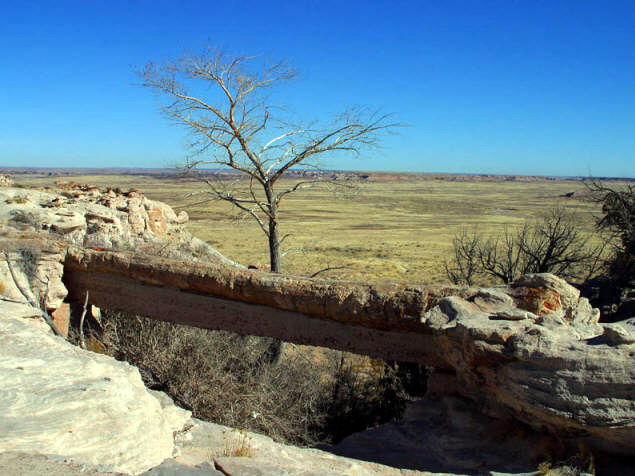 But more permanent bridges can be found in the world of geology, from the sandstone bridges of Canyonlands National Park and the Agate Bridge of the Petrified Forest National Park (it's actually a fossilized tree truck! 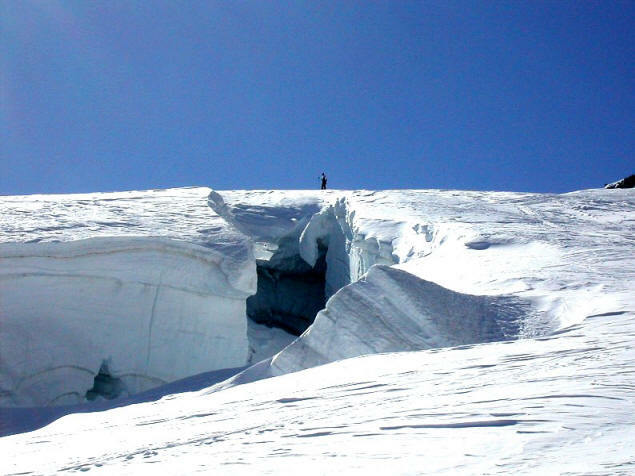 ), to the less permanent ice bridges one can find on many of our dwindling glaciers. 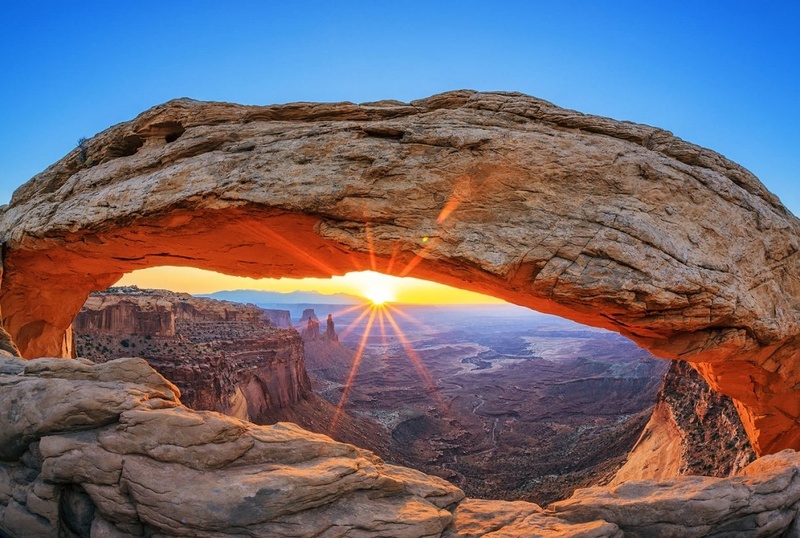 The natural bridges of Canyonlands were sculpted over the course of millions of years by wind blowing sand against rock walls. Where the eddies blew more sand against the wall than against the top, hollows were formed which eventually broke through. We know this because there are places in Canyonlands where this process is still in progress, and others where former bridges have collapsed. The Petrified Forest's Agate Bridge is a tree trunk that was fossilized in the Mesozoic era. At that time, this was a plain traversed by numerous rivers and streams, covered with horsetails, ferns and coniferous trees. When a tree fell it was covered by river-borne sediments and sealed off from the air, hindering the natural process of decay. In wet periods water containing silicon oxides filtered into the rotten wood, and when it became drier the water evaporated and the silicon oxides crystallized. The concentration gradually became so high that quartz crystals (amethyst, agate, onyx, cornelian, jasper, etc.) were formed, preserving the internal cell structure and the external appearance of the trunk. In geologically recent times erosion by wind and weather freed the petrified plant remains from the overlying sandstone, because the quartz was harder than the sandstone around it. The Agate Bridge crosses a gully, which was dug by wind and water through the millennia. In 1906, visitors worked to preserve Agate Bridge by establishing the Petrified Forest National Monument, which eventually became a National Park. The very same mechanism causes the formation of ice bridges in glaciers, but it happens much more quickly because ice is far more malleable than stone, even sandstone. By seeing the exact same intermediate forms in ice over the course of years, that we see in sandstone over the course of millennia, and knowing the relative hardness of ice compared to stone, it's easy for geologists to calculate how old a sandstone bridge is. No doubt the very first bridges were simply logs placed conveniently over creeks, mimicking logs that had naturally fallen that way. But such bridges don't last; the next good storm will demolish them. And so the search was on for ever more permanent and reliable bridges. A "monkey bridge", so simple that Cub Scouts build them now during events, may not be for the faint of heart to cross but can be quite reliable. 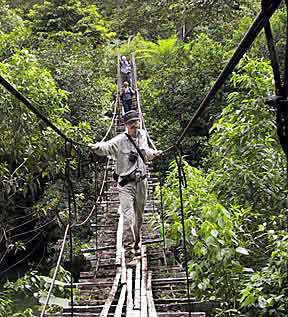 Modern day monkey bridges are constructed of rope; indigenous peoples make them of vines. Either way, they may be brought down during a serious storm; and of course since both hands are occupied during traversal they aren't ideal for carrying things across a river or gorge. Still, if you have a backpack they can come in handy. It isn't a big jump to rope bridges with a "floor" made of planks. Such bridges are also relatively flimsy; on the other hand they are inexpensive to make and repair and, despite most urban dwellers' fears, they almost never collapse while in use (because only a crazy person would try to cross one during a severe storm). Technically, this type of bridge is called a "suspension bridge", not because people walking on it hold their breath the whole way, but because it is suspended by the ropes that are anchored at either end. This basic engineering form is still used in our largest automobile bridges. And if you think pedestrian bridges are a thing of the past, you're wrong. 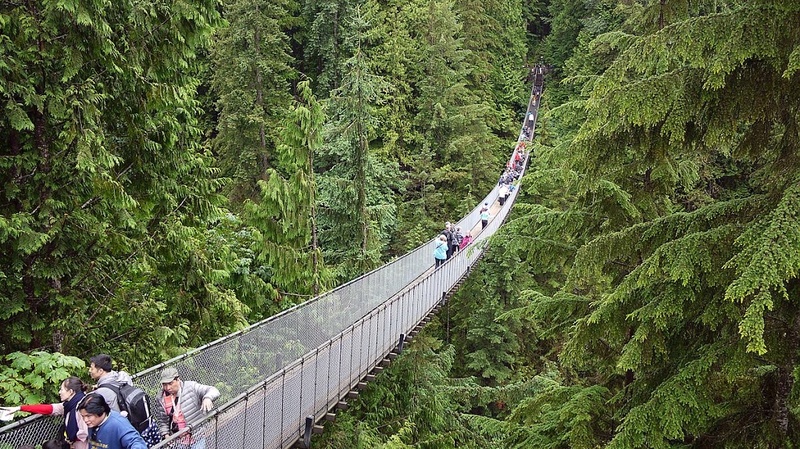 The world's longest pedestrian bridge is in Vancouver, British Columbia; it's called the Capilano Bridge and, while made of modern materials such as steel, it still is built using the same basic technology used by the ancient Incas. A more terrifying pedestrian suspension bridge is absolutely state-of-the-art. 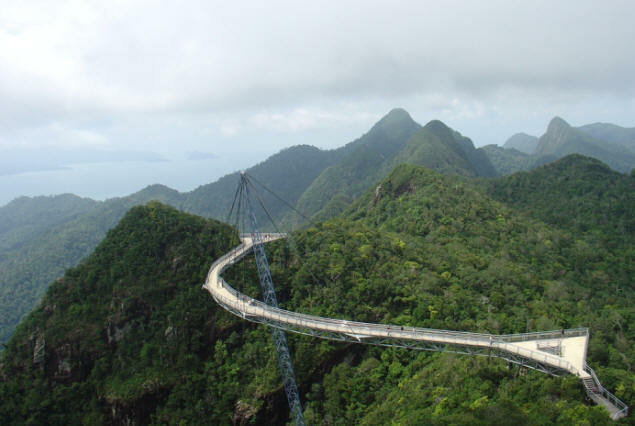 In Malaysia, the bridge curves around its central support, dangling (it seems) from a 290-foot high pillar. 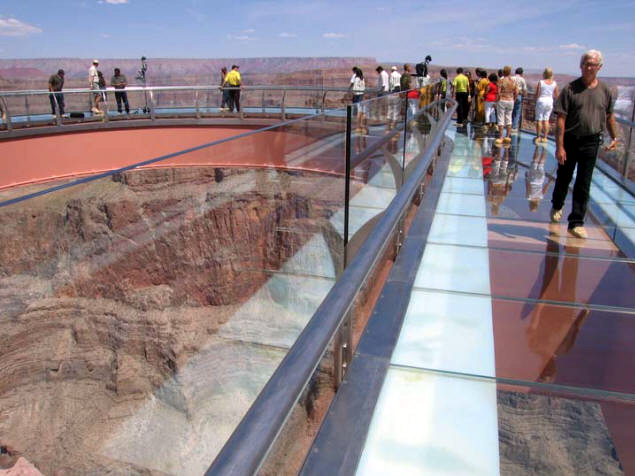 While we're on the subject of pedestrian bridges, we wouldn't want to miss the Bridge To Nowhere, also known as the Grand Canyon Skywalk. Built by the Hualapai Indians (or, rather contracted out by them) partnered with businessman David Jin, and at a cost of about $31 million, the steel-and-glass horseshoe-shaped walkway extends 65 feet beyond the edge of and 4000 feet over Granite Gorge, one of Grand Canyon's innumerable side canyons. The thing does not look safe but is; it was designed to hold 800 people at once but no more than 125 are allowed on at a time. If you want to visit the Grand Canyon Skywalk you may either drive there (it costs $20 to park and the road is not well-marked) or take a Hualapai tour bus ($29.95 per person). Admission to the Skywalk itself is also $29.95 per person. Photographs are not permitted; gripers say it is to encourage visitors to purchase postcards. Suggesting that perhaps another type of bridge has been crossed: From indigenous people to Disney-type amusement park tycoons in just four centuries.